Many teams start their Agile journey with Scrum. It offers a nice pathway into running a project, defined team roles and a clear accountability structure to clients. 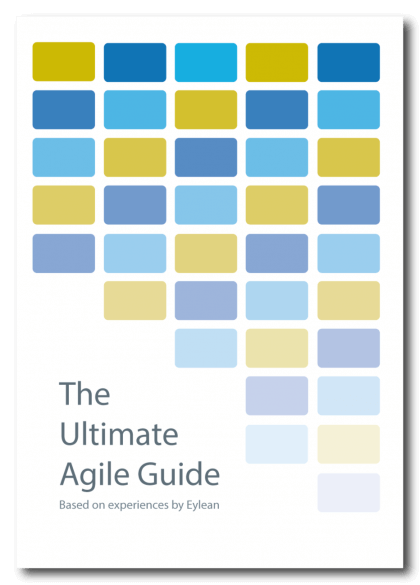 However, choosing the Agile method is just half the battle as many teams then turn to another struggle – choosing the tool. Since you are on the Eylean blog, there is no surprise i am going to say this choice is simple. 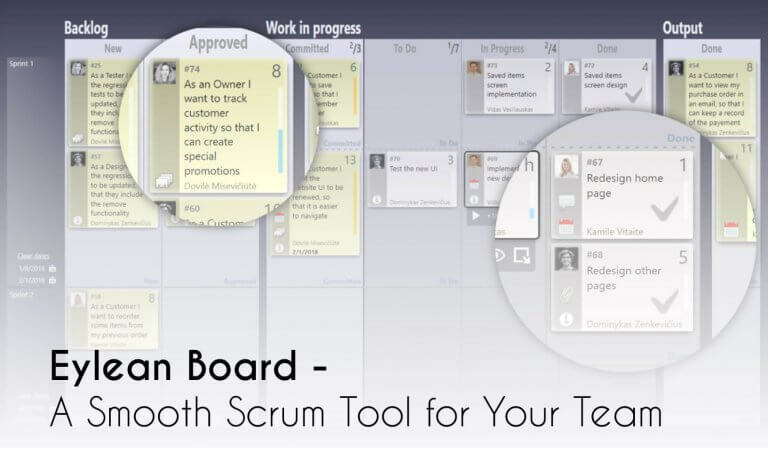 You pick Eylean Board and start your Scrum project in a few minutes! I am sure though, not all of you are familiar with the great features Eylean offers. So following are the reasons why Eylean Board should be your tool of choice for the next Scrum project. As you already know, Scrum process is well defined and teams that practice it need to go through certain steps during each iteration. Our tool is designed to help at every stage of that and this is how. The very first thing any scrum team needs to do is to set up the work space they are going to be using. This has to be easy to reach and easy to use for the whole team. With Eylean you are getting a task board that is accessible to all of the team members not only in the office, but anywhere through the shared server. So even if you are away, you can stay on top of what is happening with the project. For the actual board, you can choose to either pick a pre-designed template or create yours from scratch. The template will be a great option for those with a pretty standard process, as it will allow to start work immediately with minimal customization. And in case your process doesn’t quite fit the mold, you can easily build your own task board structure to have a work space that is an accurate replica or your activities. After your board is sorted, you will need to start adding the actual project pieces. Doind that is quite simple – double click the board to quickly add the epics you have agreed upon with the client. Then type in the name and double click once again to open the detail window. Here you can add important information such as client comments, define the size by story points and divide the large epics into small and clear tasks to be completed by the team. You can arrange the epics in any order, add categories and colors to make them easier to prioritize. Once the initial backlog set up is done, you can then seamlessly move onto the sprint planning. Simply drag the epics or the chosen tasks into the Sprint backlog to start. If you choose you can hold the Backlog in a separate board – moving tasks between boards is just as easy with drag & drop. Once you decide upon the tasks for the next sprint, you can assign them to your team members by dragging or in the task details. You can easily estimate and add the story points, describe the details of each task and attach files. All of the task information is held safely in the task detail window for you and your team members to refer to at any time. After kicking the sprint off, you will need to organize daily check ins, commonly known as daily scrums. Eylean facilitates this process as every team member can update the board at their own convenience – during or after working on their tasks. Thus ensuring the board is always ready for the standup without additional inconvenience for the team. It will be easy to overview and analyze the process too. You can immediately see if any tasks are running late or have been blocked due to external issues. Thus being able to react immediately and start solving the problems at hand with no further delay. As your process is rolling, it is likely you will want to check if you are staying on track. For that Eylean is equipped with live automated reports that reflect the current situation of the project. There are Scrum classics – Burndown Chart and Cumulative workflow reports at your convenience. Where you can check the progress quickly and without any further effort. You can also dive into additional reports, such as tracked time and workflows giving you additional insights. Everything is automated so all you need to do is open the report and you are immediately given the information. Once the time for Sprint review comes, the visual task board will be handy as well. You can quickly show clients what work was completed and check if everything meets their satisfaction. If something is array, open the task details, add the comments and move the task into the next sprint backlog. You will easily pass the required information to other team members and ensure the clients are happy with the progress. If the clients are feeling curious, you can also easily review other data, such as tracked time, estimations , etc. This way eliminating the grey area and making sure everyone is on the same page. Interested to know more about the capabilities of Eylean Board? Check out the full Eylean feature set.